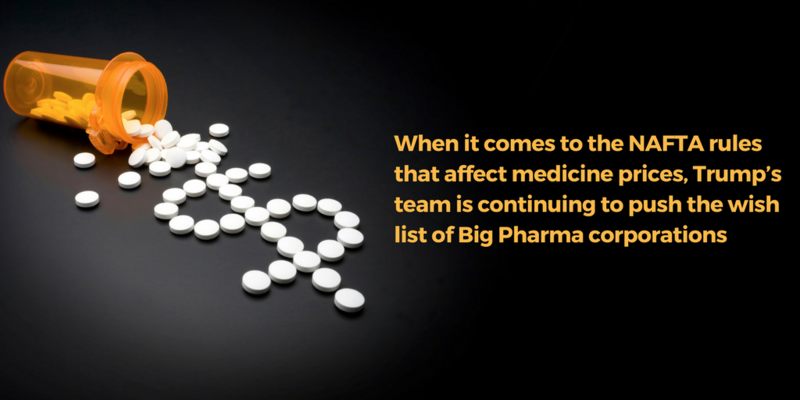 Prescription drug corporations raise the prices of needed medicines every year, compromising patients’ health and finances. The brand-name pharmaceutical business model relies on maximizing profits by selling at very high prices to the few, rather than affordable prices to the many. Unless there is competition from generic medicines, there is little reason for these firms to bring prices down. In many nations, including the United States, high medicine prices result in rationing of treatment : patients who need the medicines simply do not have access to them. The 1993 North American Free Trade Agreement (NAFTA) was the first “trade” agreement that included new monopoly powers for Big Pharma companies. NAFTA was negotiated behind closed doors under the influence of hundreds of corporate advisors while the public and Congress were shut out. As a result, excessive patent and other intellectual property protections that block competition and keep prices high were inserted. Each NAFTA country is required to ensure that its domestic policies comply with those rules. Given that “free trade” is supposed to be about increased competition, and most people had no idea that a “free trade” deal would impose new monopoly rights for drug companies, NAFTA and many agreements modeled on it that followed provided a way for the industry to expand its power and keep prices high.